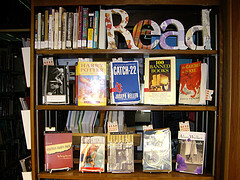 New in this month are a selection of the 2011 Quick Reads. These short, fast stories, written by bestselling writers and celebrities, are fantastic for fitting around a busy schedule of revision and studying. To find out what Quick Reads we have available, check out our displays or speak to a member of LRC staff. And don't forget it's World Book Day on the 3rd March, which is a celebration of books and reading. So if you haven't picked up a book in a while - why not borrow one today from your Learning Resources Centre. LRC Laptops - Printing now available!